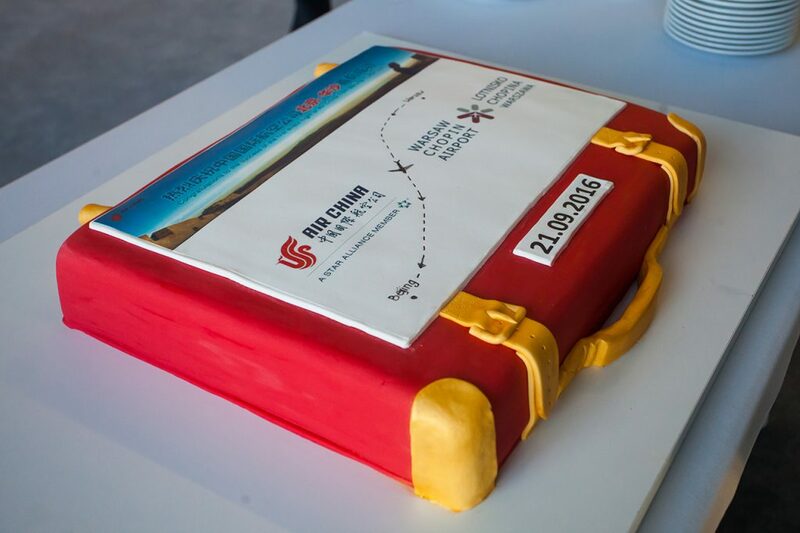 On Wednesday, September 21st at 7.20 inaugural flight from Beijing to Warsaw operated by Air China landed at the Warsaw Chopin Airport. 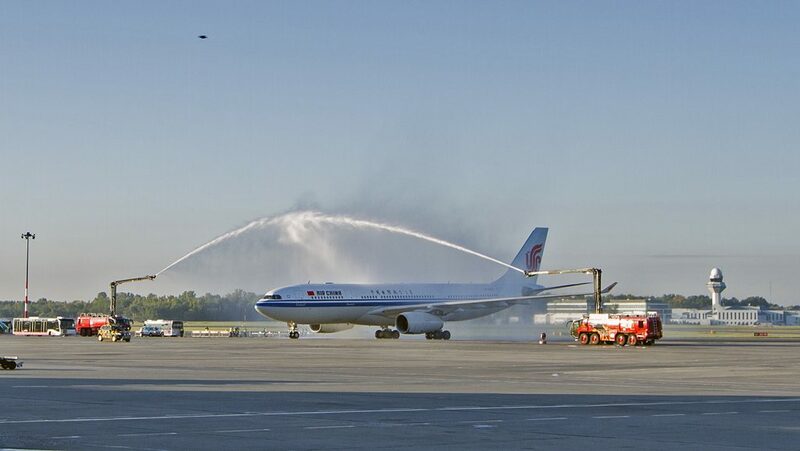 A330 plane was greeted with a traditional water salute and a cake. Flights CA 737/8, are operated four times a week on Mondays, Wednesdays, Fridays and Saturdays. The outbound flight departs from Beijing at 2:30 AM and arrives in Warsaw at 6:20 AM. The return flight departs from Warsaw at 2:10 PM and arrives in Beijing at 4:30 AM the following day. Airbus 330-200 is operated on the route, featuring full-flat seats in Business Class and personal AVOD in all classes of service. Warsaw service represents an important move to help build the “Silk Road in the Air” – said Hou Xulun vice president of China National Aviation Holding. – After Chinese President Xi Jinping’s visit to Poland in 2016, China and Poland have raised the two countries’ relationship to a comprehensive strategic partnership. In the Chinese government’s “One Belt and Road” initiative, Poland, with its important geographical advantage, is one of China’s doors to Europe. 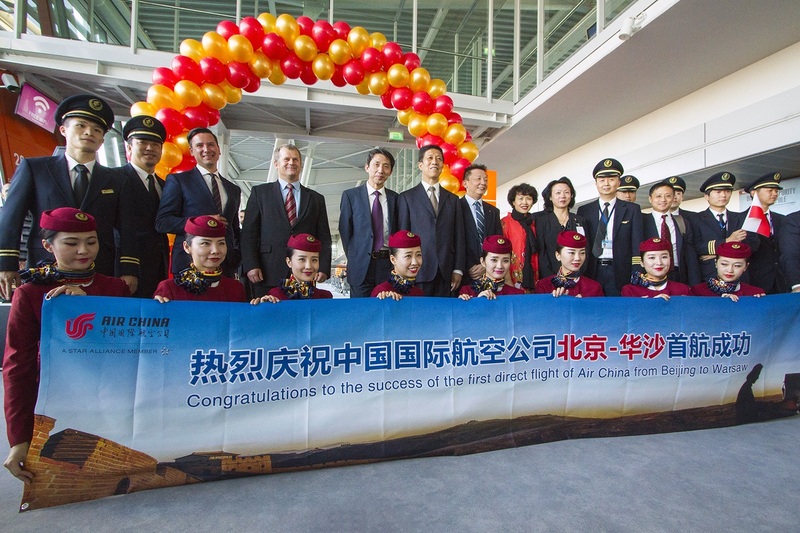 Mariusz Szpikowski, the director of Warsaw Chopin Airport, has also stressed that the launch of direct Air China flights between Beijing and Warsaw is a great event not only for the airport, but also for Poland. – Never before has a Chinese or even Asian carrier offered direct flights to Poland. It is very important for us, because we want Warsaw to occupy an important place on the route between China and Europe – said Szpikowski. The first flight arrived in Warsaw with 193 passengers, and according to the information provided by the carrier, the occupancy for the next flight exceeds 80 percent. Statistics show that 106,000 people traveled between China and Warsaw from June 2015 to May 2016, an increase of 8.4 percent. compared to a similar period last year. Air China is the largest carrier between China and Europe, offering nearly 200 flights per week. The Beijing – Warsaw service brings the number of Air China’s routes between China and Europe up to 24, serving 19 important European cities including London, Paris, Munich, Frankfurt, Dusseldorf, Vienna, Geneva, Madrid, Barcelona, Rome and Milan.